AS Peadar Gardiner stood on the presentation platform in McHale Park, the Moclair Cup sitting before him, he attempted an acceptance speech. His efforts were, however, bedevilled by feedback from an erratic microphone, and the hundreds of Crossmolina supporters splashed in maroon across the pitch had to go home with the familiar feeling of being Mayo?s best team to console themselves. It was not the first time last Sunday that northern royalty were harassed by a persistent opponent. The victors were the better side in this county final, but the margin of their triumph gives every due credit to a stubborn and often superb Shrule/Glencorrib challenge. They began the game at a frenzy, led by five points, were a score to the good at half-time, and did not allow Crossmolina to raise a flag for an astonishing 23 minutes of the second half, which included over seven minutes of time added on. What they lacked, though, was the poise of their opponent, a team whose experience has been tempered at the very highest levels of the game. Cross? were able to harry, to fill space, to press the life out of budding attacks by the border team. But there is no shame in this loss for Shrule/Glencorrib: they have made progress over the past half decade that is admirable, and when the sting of such a loss diminishes, there should remain a team with aspirations to this level in coming seasons. There were the guts of 5,000 people poured into the county ground come 3.45pm, the majority streaming from the south of the county. By the time Peter Geraghty tossed in the ball – the official had a mixed afternoon on a day when both sets of players behaved impeccably – the atmosphere was cranked up, and it seemed to spill over the sideline and affect the players, as we waited nine minutes for the game?s first score. This was preceded by much chopping and changing, with the grapevine getting it right when Jimmy Nallen strode in to pick up Conor Mortimer, and James Lohan returning from a hamstring injury to take his place at midfield for Shrule/Glencorrib. Both of these deviations from the named line-ups proved significant, with Nallen?s experience, while not snuffing out Mortimer?s threat, certainly quelling it, as Lohan worked through a mountain of ball and was a stand-out performer. Both sides had the umpires waving for wides, before Mark Ronaldson almost goaled. A quick free by Trevor Mortimer caught the Crossmolina defence out, and Ronaldson moved onto the bouncing ball, flicking it towards goal. Barry Heffernan had to get down smartly to push it out for a 45. A long, probing pass from Trevor was the conduit for their first score, Conor dashing out ahead of Nallen and arcing over a point. Three minutes later, he was first on to a breaking ball and snapped over tidily from almost 50 metres out. The underdog were snarling at this stage, with Cross? looking decidedly uncomfortable. This might have given way to the first whispers of panic after 13 minutes, when Ronaldson diverted another long ball into space, ran on and pierced a shot beyond Heffernan. He was giving a torrid time to Jonathan O?Boyle. But this is when the years of winning county, Connacht and national titles stands to a team like Crossmolina. They responded to Shrule/Glencorrib?s vibrant start with a goal that was wonderfully well-worked. Michael Moyles collected McDonald?s pass, and flicked the ball back to Noel Convey. The corner-forward then pitched a delightful pass into space for Moyles to attack, and the ball ended up high and hard beyond Derek Walsh. Two Ciar?n McDonald points, one a free and the other a great score struck while he was off-balance and under defensive pressure, had the teams level by the 24th minute, and there followed a rush of scores before the break. Peadar Gardiner barrelled through the defence of Declan Ronaldson?s team, a trick he was to repeat to telling effect throughout the game, and his run was not tracked. He played a one-two with Paul McGuinness and smacked over, an effort that was followed less than 60 seconds later by the point of the match from McDonald, who nailed a thundering effort from the left-hand sideline. By this stage, he was being picked up by Dermot Geraghty, who enjoyed patchy success on him, and Trevor Mortimer had moved inside to full-forward. After a neat Mark Ronaldson score, Darren Murphy pulled out his own contender for the match?s best point, punting long, hard and sweetly accurately over the bar with his left boot. The half?s last action saw Shrule/Glencorrib enter the dressing-rooms with a one-point lead, Mark Ronaldson, their most threatening player on the day, slapping over after sloppy Cross? defending. Hardly had the din of half-time chat from the stands stilled when Crossmolina goaled. Thirty-three seconds died between the restart, and a green flag heralding a fine Brian Benson score. Once again, Gardiner galloped through the centre of the Shrule/Glencorrib defence with far too much ease, and fed Brian Benson, who cleverly placed his shot beyond the frame of Walsh. The brothers Mortimer, Trevor and Conor, posted a point apiece by the fourth minute to level the teams, but Crossmolina then hoarded five points in seven minutes, the last their final score of the game, but it was a push potent enough to claim the title. Benson gave just reward to good McDonald work to land a point, before yet another Gardiner gear-change through the defence yielded a point. Michael Moyles bent over a sweet score from the left, and Paul McGuinness and Moyles again completed the spurt. They faltered by five points, but Shrule/Glencorrib did not panic. David Geraghty, a fine performer for the club all year, bustled up from the half-back line to add a score, while Conor Mortimer flicked over a 14 yard free, after a baffling foul was awarded against Gabriel Walsh. Conor found the range with another free by the 56th minute, there were two points separating the sides, and the south Mayo side sensed not all hope had whistled away. Conor failed with another dead ball kick, while Ciar?n McDonald effected a crucial block around the middle to hamstring one of the waves of attacks washing over Crossmolina. James Lohan lashed a ball across the Cross goal that was gathered and pointed by Conor Mortimer, but by then over seven minutes of added time had been played, and it was a challenge too far for Shrule/Glencorrib. Crossmolina were revelling in that old familiar feeling so beloved of winners. The Mayo ladies team were warmly welcomed home when they crossed the bridge in Shrule yesterday (evening) with the Brendan Martin Cup. The difference between victory and defeat was there for all to see. Last year?s narrow loss to Laois made this year?s win all the more special and, in many ways, led the team to a far greater appreciation of their achievement. 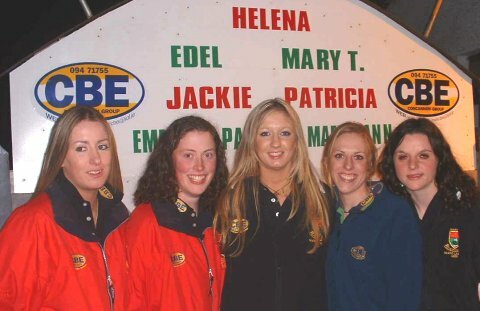 There were big welcomes for all the local girls including Helena Lohan, Mary Teresa Garvey, Emma Mullin, Christina and Marcella Heffernan, Denise Horan, Edel Biggins, Edel Reilly, Jackie Moran, Patricia Moran and Maeve Ann O?Reilly. The Shrule-Glencorrib, Kilmaine and The Neale GAA Clubs have all joined in the good wishes to the team and especially to all the girls from this region.